Over the next four years the demand for pallets is expected to rise, which is good news for pallet manufacturers around the world. Hexa Research recently released a report predicting growth in the pallet industry due to the increasing demand for transportation methods that are safe. It also predicted growth in the transport industry supporting shipped goods. A number of reasons are given in the report for the growth in pallet use, but the environmental advantages of reusable pallets seem to be at the heart of the growth. New wooden pallets, including Euro pallets, are leading the way in the upward trend in pallet use. Made from environmentally friendly products, especially when sustainably sourced, wood pallets are known for their durability and the fact they are easily recycled. Corrugated paper pallets made from honeycomb, corrugated and moulded pulp provide a manufacturing option that is cheap to produce, supporting the growth of paper pallet use in the coming four to six years. 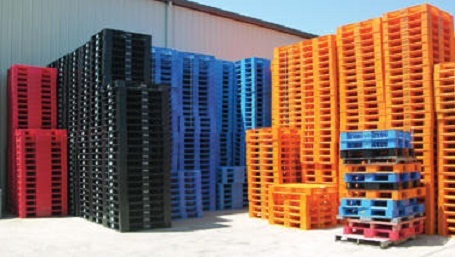 The use of plastic pallets has also experienced significant growth; they are most commonly made from PVC, polypropylene and HDPE. The Hexa report suggests this growth will continue in the foreseeable future. A barrier to the predicted growth could be restrictive EPA regulations as they apply to pallets made of plastic. An awareness of environmental benefits, such as the ease with which pallets can be cleaned and subsequently recycled, and the abundance of suitable raw materials also contribute to making the increased use of pallets appealing. One type of pallet reported to show no growth in numbers used is the metal pallet, which is made from products such as carbon steel, aluminium and stainless steel. The lack of growth is attributed to the niche nature of applications using metal pallets and the lack of organisation in these areas. As the transportation industry continues to grow, so does the use of pallets, which are widely recognised as vital to the infrastructure of modern transportation systems. Glossary manufacturing was identified as the largest user of pallets in a range of pallet sizes, including the Euro pallets. The report identifies the food and beverage industry as drivers of growth, as they increase the number of pallets used for shipping. Growth in this industry is attributed to rising demand and the need for functional food, along with the increase in consumers’ disposable income around the world. The strongest market for pallets is found in North America, largely due to the importance of manufacturing in the region. Europe came in second in terms of market size. Increased growth is expected to come from China and India due to the continued expansion of industry and manufacturing, particularly in industries such as automobiles and packaging in these countries. Predicting positive growth in the pallet industry, the Hexa report finds that opportunities abound for existing pallet manufacturers in significant end-use industries, and openings should be readily available for new players in the market.